Action from a recent Yaxley game. 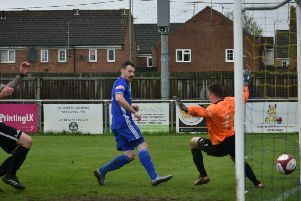 Yaxley hope to celebrate an excellent campaign with the best United Counties League finish in their history and success in the League Cup Final over the Bank Holiday weekend. A win at home to ON Chenecks in their final league game tomorrow (April 29) would confirm the Cuckoos as third-place UCL Premier Division finishers. Equalling the result of fourth-placed Desborough (away to Eynesbury) would also see Yaxley seal third place. Yaxley then tackle in-form Wisbech in the final of the UCL Cup at Peterborough Sports FC on Monday (May 1, 3pm). Wisbech, who have an easy league game at Harrowby tomorrow, have won their last six Premier Division matches and sit sixth in the table. The top two in the UCL Premier Division Peterborough Sports and Deeping Rangers contest the Hinchingbrooke Cup Final at Yaxley FC on Tuesday (May 2, 7.45pm). Sports are the holders. Premier Division: Boston Town v Deeping Rangers, Harrowby United v Wisbech Town, Holbeach United v Wellingborough Town, Kirby Muxloe v Peterborough Northern Star, Leicester Nirvana v Huntingdon Town, Newport Pagnell Town v Peterborough Sports, Yaxley v Northampton ON Chenecks. League Cup final: Yaxley v Wisbech Town (3pm Peterborough Sports FC).